As a Google Educator & Certified Trainer, I provide tips and tricks based on Google and Android with emphasis in Education. Follow eduGOOGdroid on Twitter & Facebook. eduGOOGdroid.com is part of CM Garza. I, Carlos Garza, am the owner of the business. CM Garza provides Computer Technology Consulting. eduGOOGdroid provides consulting services in reference to Educational Google & Android. I am a High School Computer Teacher. 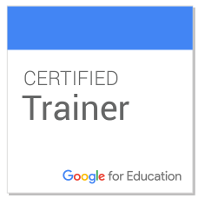 I am a Google for Education Certified Trainer and am always pursuing to better my self.